Narrated by Feyre and Rhysand, this bridges the events in A Court of Wings and Ruin and the upcoming novels in the series. 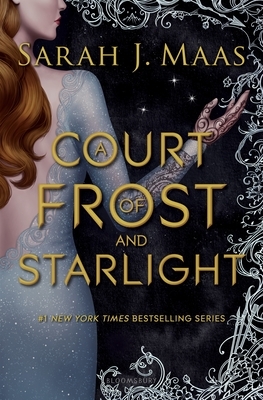 New in the #1 New York Times bestselling Court of Thorns and Roses series, A Court of Frost and Starlight is a glimpse into the lives of Feyre and Rhys as they begin to recover from the war that changed their world. Feyre, Rhysand, and their close-knit circle of friends are still busy rebuilding the Night Court and the vastly-changed world beyond. But Winter Solstice is finally near, and with it, a hard-earned reprieve. Yet even the festive atmosphere can't keep the shadows of the past from looming. As Feyre navigates her first Winter Solstice as High Lady, she finds that those dearest to her have more wounds than she anticipated -- scars that will have a far-reaching impact on the future of their Court. Throne of Glass was Sarah J. Maas's first full-length novel to be published, though she already had a large online fan base, many of whom discovered this fantasy world in its first incarnation on www.fictionpress.com, written when Sarah was just sixteen. Throne of Glass was shortlisted for the Waterstones Children's Teen Book of the Year and has sold in thirteen languages. Sarah lives in Southern California, USA. You can find out more about Sarah and Throne of Glass at www.sjmaas.livejournal.com.